What makes Scratch Conferences so special ? This Amsterdam 2015 edition has proven it again : it's the sharing siprit. Everybody adds his piece, be it the teacher who just discovered the learning potential of Creative Computing, the Education Science researcher sharing insights, or the developper giving acces to solutions he built for kids. And the many ones like Magic Makers, who teach kids to code to learn throughout the world. There's no way you can see it all, as they are nearly as many people presenting workshops, talks and poster stalls than attending them. "40 parallel sessions tomorrow. But where is the clone (Scratch) function ?" Miscellaneous : my very own Twitter Storify with picctures and links. What I'm most proud of ? Having helped to organise the conference, and bringing a team of 12, both Magic Team and the 2 students team that led projects with us this year. This is the main point I got back from the conference : sharing the idea that that what matters with technology are the people. Us. Linda Liukas put in a nutshell : « The DNA of internet is humanity ». We were so very lucky to hear a read the first chapter of Hello Ruby. This much awaited Book teaches kids computer logic through stories and games, and beatiful hand drawings by Linda. This project was a huge Hit on KickSarter , and along with the 9000 other people who backed, I'm looking forward to receiving her book in my mailbox. She showed us in a very crowded workshop how she uses unplugged activities, and I will certainly try some of beautiful examples available on her Hello Ruby WebSite. Audrey Waters, smart writer of Hack Education blog, reminded us that "without Ed Tech criticism, we are stuck". I am convinced that we must never forget why we teach kids : so that they learn to learn. When we use technology, when we teach coding, the question is : what will kids learn thanks with the tools we give them ? Audrey quoted Seymour Paperts ideas to make her point, ideas that are over 30 years old, and a great link to Cynthia Solomon introduction to the conference. 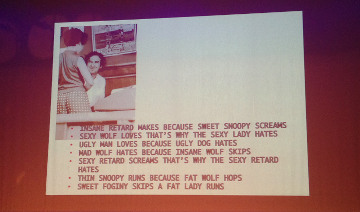 Cynthia Solomon used to work with Seymour Papert when he researched on how computers should be used as learning tools. We owe him the Logo Turttle, and his thinking is the substract on which the LifeLong KiderGarten Lab at MIT developped Scratch. I was impressed by the pictures from a 1968-69 classroom. What has, or has not changed since the end of the sixties ? Already at that the time he showed us kids playing and creating with computers (computers without sccreens !). A teacher, walking into the room and finding kids playing with a random sentence generator they had coded, said at the time : "But this not a Math Course !?" THE big news : Scratch will soon be available on Ipad. I personally handled with my own hands the beta version ! Though I am convinced that you still need a keyboard and a mouse to conveniently create with a computer, I know it has been long awaited by many. Need a proof ? This was my most retwwited Tweet from the #scratch2015AMS conference (and ever, in fact). So hook on @scratch feed for more info on the release date. 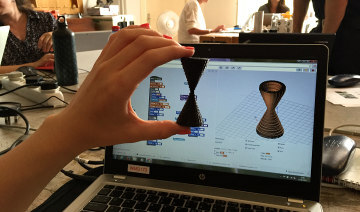 With BeetleBlocks, you can design 3D objects and print them with any 3D printer. The point ? You design objects programming moves like you do with Scratch, except with 3 dimension axes x ; y ; z.
I love the fact that you can toy around with instructions, and see the volume you created as a result. I'm pretty sure it will get kids excited and lead them to better understanding of geometry through experimenting. One step closer to Mathland ! This is a new project from Eric Rosenbaum, to which we already owe the Makey Makey. He built a specific version of Snap! with help from Bernat Romagosa from Citilab and Jens Monig, of course (dad to Snap !). Knowing a little about Eric's vision, this is no surprise he gets us excited again ! You Can Hack Twitter With Scratch ! 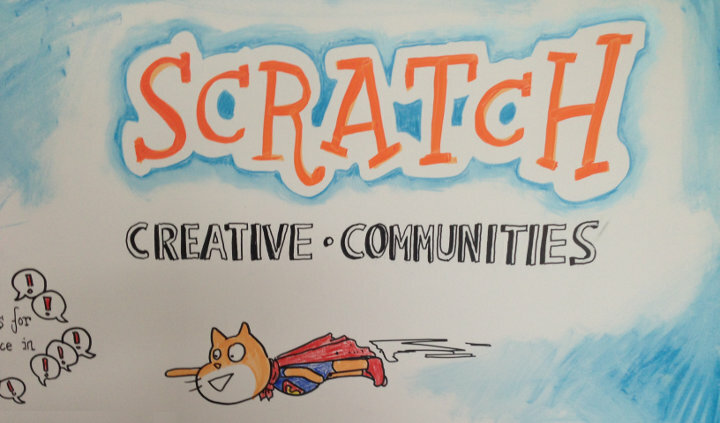 Another good news from the conference is the new (and beta) ScratchX site that @scratch Team at MIT showed us. It provides an easy way to find and install extensions software to link Scratch with the outer world. One thing I like when exploring with kids what you can create with code, is to realise you have power on objects. you can have kids program Legos, Electronics objets with Arduino or Raspberry Pi, Parrot drones... you name it ! 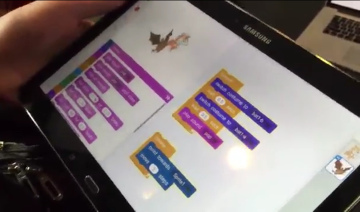 Using Scratch to progam objects makes it accessible to kids. But connecting Scratch to hardware might prove an ordeal for non tech (and tech) people. 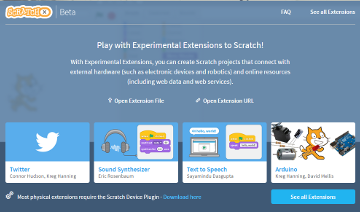 The ScratchX site makes it easier to access and install these extensions. Do you feel like hacking Twitter with Scratch ? Now you can ! And the winner for most amazing project is ... Brain Control ! Carmelo from CoderDojo Bologna has connected a brainwave headset to Scratch. By simply focusing your mind or blinking, you can interact with a game programmed with Scratch. Wow ! A wonderful idea, initially designed for people with disabilties. Well, the extension is not yet online on scratchX, but just tweet him to ask for it ! We were happy to have our two teams of Students presenting their projects with Magic Makesr and their Engineering schools. Both team shared the same brief : enable unplugged electronics programming with Scratch. So far, solutions used to program robots, or handmade weather stations for example, required the electronic object to be plugged by usb to the computer running Scratch. But robots tied to a computer are only half fun ... and unplugged solutions are much harder to use with kids or beginners. Telecom ParisTech Team chose to control a Raspberry Pi mini computer with a wireless connection. Our three girls developped a solution to turn the Raspberry Pi into a Wi-Fi hotspot, and have it programmed with Scratch 1.4 from a nearby computer. No plug required, only constraint is to stay within the Wi-Fi range. On top of their prideful souvenir picture with Mitch Resnick, you can find their code and tutorials on github. The Sup Galilée team chose Arduino, and developped a solution enabling to upload Scratch code on the Arduino processor, and then get rid of the cable. A smart solution, that completes the already existing solutions to program Arduino with Scratch 2.0. And they did modify the Arduino kernel to support10 actions (threads) in parallel instead of just one, matching Scratch parallel programming. How cool is that ? Find their code on github. Re-live the conference as if you were there, with Tweets and Pics ! Starting with a cool vidéo by Ricarose and Eric's videos Scratch Team. @agaddone Going to rent a bike now. Interested? 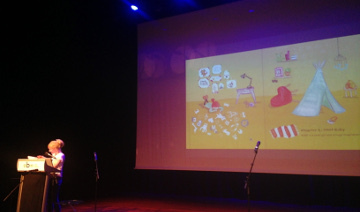 And, last but not least, Huge Thank to Joek to which we owe #scratch2015AMS : you rock !